Successful companies don’t react to change; they drive it. 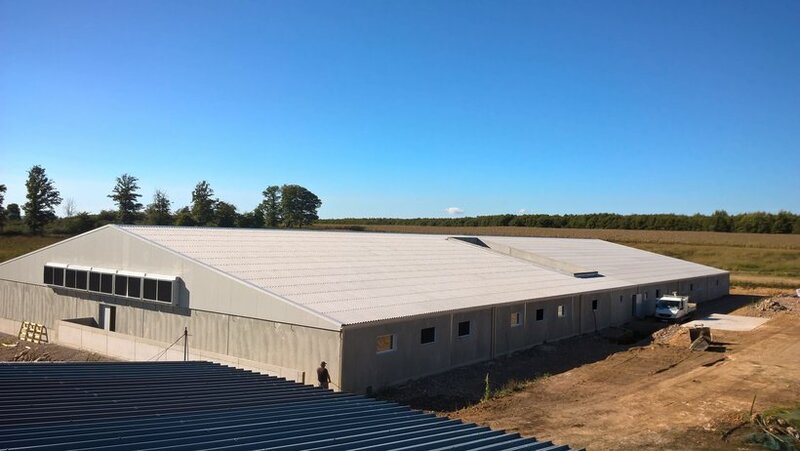 With that in mind, Hypor recently opened the doors on a new state-of-the-art facility in Sichamps, France. In the process, they offered a window to the future of pork production and demonstrated that for Hypor and its clients, the future is now. The renovation to modernize and expand this 400-sow unit was an expensive one, but the return on investment is significant. It starts with increasing the places to 1,990. As the market seeks bigger boars, Hypor’s genetics have responded by selecting for larger animals. The challenge now is designing the barn to be future-friendly, so the boost in capacity at Sichamps is perfectly timed. But that’s just the beginning. Hypor has also installed 72 PPT feeding stations, another enhancement that’s all about being on the cutting edge of progress. As the feed conversion of Hypor’s animals continues to improve and animals produce more with less, this move allows for precise filling of feeders. All other pens are equipped with precise multi ratio group feed registration in order to also measure the gilt’s group feed conversion. For Hypor, it will enable the collection of more accurate (individual) feed intake and daily weighing records. For you, it means that lines like the Hypor Maxter and Hypor Magnus raise their feed efficiency and lower your feed costs. And for your business, that means everything. Another notable feature of Sichamps is the BioPigLift technology used for boar testing. This is a crate with a lift apron to immobilize the pig for weighing, auto processing and ultrasound scanning to determine backfat depth, loin muscle and intramuscular fat (IMF). It is yet another example of Hypor embracing the future and their clients reaping the rewards. Even the ventilation system is designed to maximize results. It’s prepared for both air washing and air filtration, and the incoming air can be cooled or heated to maintain a constant climate throughout the year, which is ideal for breeding. Along with the renovation, Hypor is implementing protocols like upgrading the health status of the farm with a special repopulation program. By focusing solely on SPF (Specific Pathogen-Free) pigs, Sichamps will achieve the highest health status available in the market. By helping industry respond to changing consumer demands, Hypor can ensure healthy profits for producers. Like everything Hypor does, this upgrade supports their focus on Total System Profitability. Apart from aiding producers with technology that enhances feed conversion, Sichamps is good news for processors and distributors as it boosts meat quantity and quality. Finally, the new features benefit the planet by reducing cost of production, energy use and the industry’s carbon footprint. While the Hypor Magnus is already a leading market boar in North America, the investment in Sichamps will help raise the profile of the Hypor Magnus in Europe and respond to the growing Duroc demand. As important as this facility is for making progress, it’s also making a statement. And as equations go, there’s one that really adds up for producers: Hypor products + the latest technology = A bright future.